I imagine this new Internet ID card will make this easier in the long run. Interesting that they seem to be going after anybody that even followed him on twitter or at the very most gave money. The only difference between us and the Chinese is ethnicity and population size. We are both ruled by thugs. Lets all go fishing eh? Tracking the wikileak tweets? Seems like a very loose long thread to follow to me. How about everyone that visited the website, or even those who tried and didn’t make it for whatever reasons I forget. I wonder just how “effective” I might actually want law enforcement to be given they are all too often used for political ends. Remember Kent State, ha, ha. Nothing changes in a Brave New World. The Obama DoJ is looking to find a single reason to investigate Wikileaks, because it has none right now. 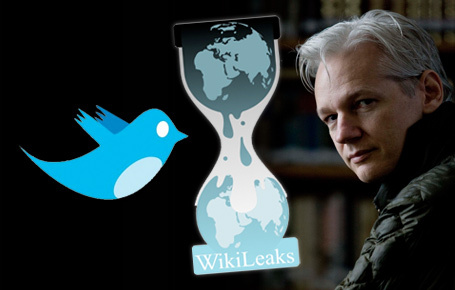 If it finds that one of the twitter accounts of the 600,000+ out there that follow Wikileaks can give it any reason to ask a judge to give a warrant then they will run with it. This is not justice. This is fishing. There’s too much data (from twitter) to actually be useful, they’re just trying to stifle discussion and chill free speech. And it does scare me some, since I will be on that list. This is going on my car’s rear window with a graphic of the Wikileaks logo. You can be pretty sure “they” already know there’s something to be found (no fishing necessary), and are now pursuing the legal paths to the evidence they need to put on a convincing “trial” to squash the very inconvenient Wikileaks. If you think there are no agencies with hooks into the innards of Facebook, Twitter, Google, Yahoo et al then naiveté wins again. Isn’t everything on Twitter going to be donated to the National Archive? Doesn’t that make everything on Twitter public record? Good for Twitter for at least letting it’s users know about the subpoenas – it won a court challenge. The first on-line service to not quietly fold like a card deck. How intersting, you expose the ineptness of our Government and they try and hunt you down. I guess its why our mainstream media are such wimps. Their afraid of uncovering something or else their controlled by the government. #11 – yes, this isn’t about the contents of the tweets, it’s about the names, addresses, credit card numbers etc of those traitors who dared to read it. There is probably a copy of the constitution in the national archive – but you would want to keep a careful eye on anyone who wanted to read it. As #1 Dog intimated. But, don’t worry. It’ll all be voluntary. For a while. Then they’ll find they need several thousand new IRS agents to enforce it. Doesn’t the gov’t realize when they do things like this, they simply encourage everyone to learn how to encrypt? How to use a VPN? Can you say, “TOR”??? The US goes down the drain day by day. Can’t wait for the other 220,000 cables. But then, i’m international, so, the DOJ would have to go to my DOJ and get a subpoena over here. Damn them! can’t they just take it on the chin and clean up their act? oh yeah, that’s right, corrupt people don’t like being caught out..
All of tweets are ending up there, but none of the user info. Its one thing to know that “star69” said “Call me back” and quite another to know who is “star69”. It was really funny when I spied it on a press release for the “Department of Indian Affairs and Northern Development, Canada“. I pointed out the absurdity of declaring a PRESS RELEASE as PRIVATE AND CONFIDENTIAL to the person writing it and was met by a blank, bovine stare. I told the person that if it was a PRESS RELEASE, by definition, it wasn’t private and confidential. It was NEVER printed by any of the news organizations to which it had been addressed. After a few more tries with other documents, the personel office realized that this was one dodo that needed to be reassigned, preferably to some remote outpost, out on the remaining ice floes. #18 Oh that is funny. Lest any American boast that we aren’t that stupid just think about what we put people through to be passengers on planes and then let the service people in without checking them or that we search pilots after giving them guns. The TSA is a multibillion dollar farce. Please also think about all the places we don’t check like trains and ball games and what it’s going to coast when the lack witted nincompoops in Washington decide to body and cavity search everyone attending such events. Am I the only person who simply does not care about Wikileaks? Not one tiny bit. I guess I just am dumb. Happily so. I don’t tweet of Facebook. So I guess I am just not with it. Like John C, I am an amateur radio operator. For thirty two years now. And a physics and history buff. I just don’t have time for tweeties. Including this site, it’s in the public domain? Bad Behavior has blocked 19487 access attempts in the last 7 days.